After our first scheduled trip to the Cairngorms National Park in Scotland was flushed down the metaphorical pan by the 'Beast from the East', there was legitimate concern that the Falmouth University MNHP annual field trip wouldn't take place in 2018. Well thanks to the determination of our trip leaders and students involved we managed to pull it together. Later in the year than usual, so this time we won't very likely see any white snow hares or red deer. But we have been given the gift of experiencing a completely different Cairngorms adventure. We have a whole plethora of exciting wildlife watching opportunities to look forward to, ospreys and dolphins to name a few! A total of twelve of us, including IoP techie / MNHP Cairngorms field trip legend Mark Wallwork, and a little known photographer who goes by the name of Neil Aldridge are heading up to the Cairngorms for the week. We set off this morning (May 19th) at about 9:30 for the savage journey from Falmouth to Carlisle, where we'll bed down for the night before finishing the journey up to the Cairngorms tomorrow morning. We're still a team member short in the minibus as Claire is set to meet up with us in Scotland tomorrow. 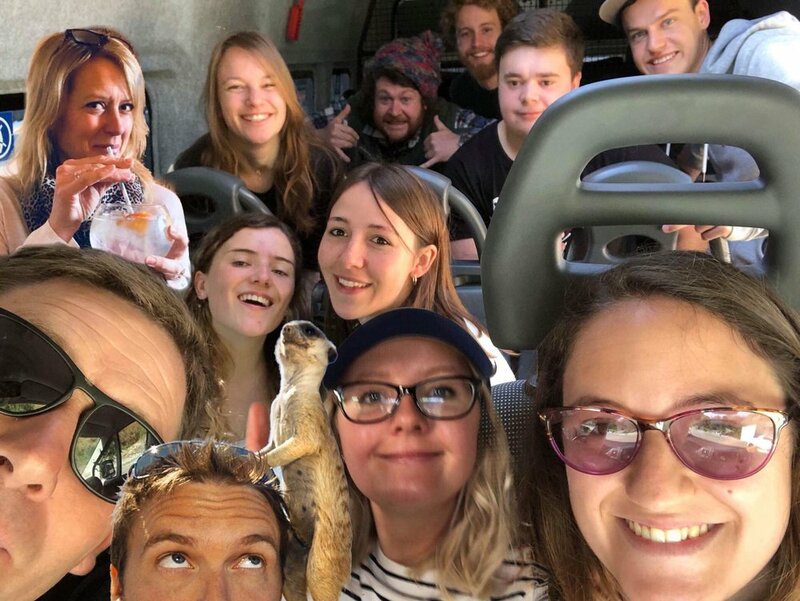 Obviously, the actual bus ride hasn’t been too fruitful in wildlife and conservation photography opportunities, so the image side of this post will be fairly light so we appropriated a cheeky meerkat from Neil's website.. as you'll see at the bottom of this post. Rose has shot a little bit of 360º footage of the journey and will continue to shoot more across the trip so by the end there should be some interesting 360º content of our adventures! Claire Spelling: *website under construction. along with workshops, using camera trapping and timelapse techniques. There’s surely going to be tonnes of content to be uploaded so watch this space, there’ll be fresh posts every evening for the whole week. Newer PostCairngorms MNHP 2018 - Arrival.